Monsieur Ben M'Hidi, don't you think it's a bit cowardly to use women's baskets and handbags to carry explosive devices that kill so many innocent people? And doesn't it seem to you even more cowardly to drop napalm bombs on defenseless villages, so that there are a thousand times more innocent victims? Of course, if we had your airplanes it would be a lot easier for us. Give us your bombers, and you can have our baskets. -- Dialogue from The Battle of Algiers, dir. Gillo Pontecorvo (1965). 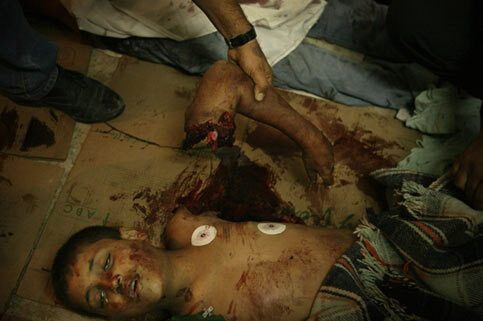 Eight-year-old Raed Ahmed Al-Batsh and his brother Mahmoud (15), two of three children killed when an Israeli F-16 fired a missile into the street where they were walking; Gaza, 6 March 2006. Eight-year-old Ashraf Abu Khader and his brother Bilal (12), killed when an Israeli helicopter fired two missiles into the street where they were playing. Jenin, 31 July 2001. 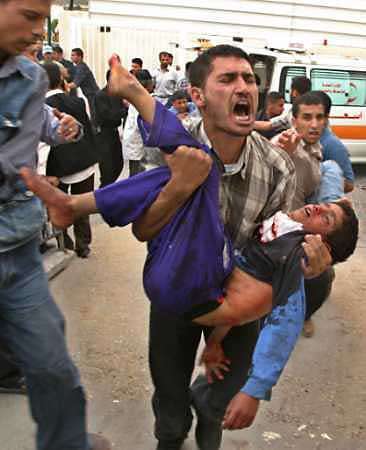 Muhammad Abu-Shmaleh, one of about 140 Palestinian civilians wounded when Israeli helicopters fired two missiles at a car travelling down a street in Nusseirat Refugee Camp on 20 October 2003. Muhammad was struck in the neck by a flechette dart from the second missile, as he rode in a taxi on the same street, and was left irreversibly pentaplegic. At least ten civilians were killed in the same attack, including two children and the doctor who had arrived at the scene to treat the victims of the first missile, only to be killed by the second. 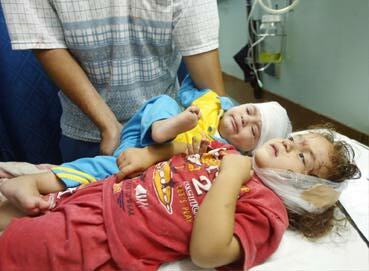 Unidentified children, two of about 140 civilians wounded when an Israeli helicopter fired a flechette missile into Nusseirat Refugee Camp, 20 October 2003. (Photo al-Quds al-Arabi, 21 Oct 2003). 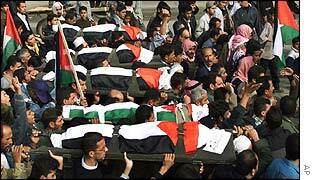 Seven of the 10 Palestinian civilians (including six children) killed when the IDF shelled a protest march in Tel Sultan, near Rafah, 19 May 2004. The IDF initially claimed that the ten were killed when a makeshift bomb they were carrying detonated prematurely. It then acknowledged that it had fired tank shells in the vicinity of the dead, but insisted it had hit only empty buildings and open fields. Israel's ambassador to the UN, Dan Gillerman, then falsely told the Security Council that, even if the IDF had killed the eight Palestinians, "four to five were armed terrorists". The IDF later scaled back its claim, asserting that there was only one gunman among the dead (and Israeli officials acknowledged to the Guardian that even that one was doubtful). Footage captured by an AP camera crew (featured in Fox News: Attack on Rafah Camp), showed that the ten were killed when the IDF fired four tank shells and a helicopter missile into a crowd of protestors, none of whom - on review of the video footage - turned out to be armed. The protestors were demonstrating against the IDF invasion of nearby Rafah refugee camp and, according to Israeli journalist Amira Hass, were trying to deliver food and medecine to residents trapped there. (Photo: Kevin Frayer for AP). Nagy Abu Kamar, 12, one of six Palestinian children killed when the IDF shelled a protest march in Tel Sultan, near Rafah, 19 May 2004. (Photo: Johannes Abeling). Mubarek Saleem Al-Hashash, 9, one of six Palestinian children killed when the IDF shelled a protest march in Tel Sultan, near Rafah, 19 May 2004. (Photo: Kevin Frayer for AP). 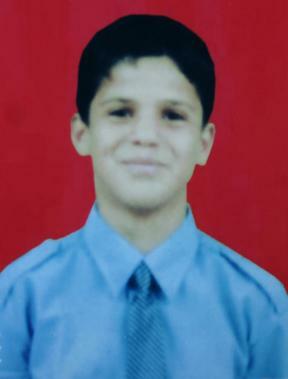 Mohammad Tarek Mansour, aged 12, one of six Palestinian children killed when an Israeli tank shelled a protest march in Tel Sultan, near Rafah, 19 May 2004. 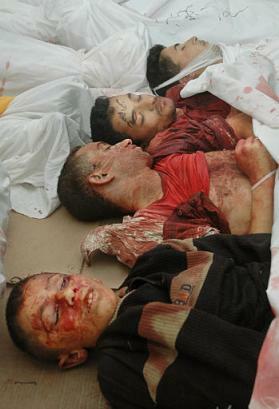 Unidentified dead youths, four of the 10 Palestinian civilians killed when an Israeli tank shelled a protest march in Tel Sultan, near Rafah, 19 May 2004. (Photo: Hatem Moussa for AP). 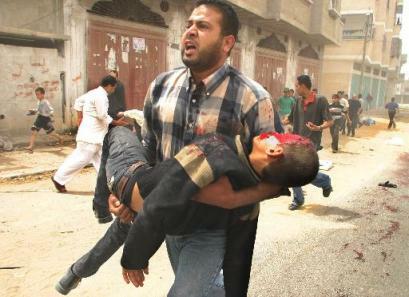 Unidentified dead boy, one of 10 Palestinian civilians killed when an Israeli tank shelled a protest march in Tel Sultan, near Rafah, 19 May 2004. (Photo: Muhammad Salem for Reuters). Unidentified dead boy, one of 10 Palestinian civilians killed when an Israeli tank shelled a protest march in Tel Sultan, near Rafah, 19 May 2004. (Photo: Khalil Hamra for AP). Thirteen-year-old Ahmad Mughayer and his sister Asma (16), two of at least four Palestinian children shot dead by IDF snipers in Rafah, 18-19 May 2004. The Mughayer family reported that Asma and Ahmad had been shot by an IDF sniper while they were feeding their pigeons on the roof of their house. 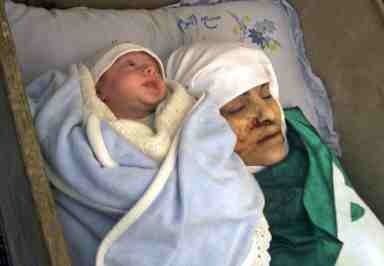 The IDF maintained that Asma and Ahmed were killed when a Palestinian bomb exploded in the street outside their home. British and Australian journalists who examined the bodies at Rafah morgue found that they had suffered no injuries other than a single shot through the head, and that the only damage visible at the Mughayer house was from bullets fired from the direction of an IDF sniper's nest overlooking the house. (Photo: Kevin Frayer for AP). 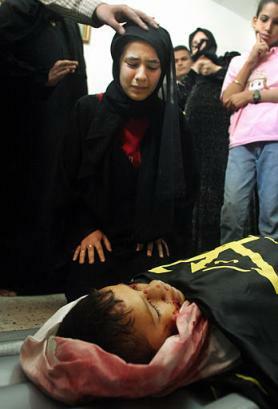 Sabir Abu Libdah, 13, one of at least four Palestinian children shot dead by IDF snipers in Rafah, 18-19 May 2004. Sabir's family was trapped without water for two days when IDF tanks destroyed water and sewage pipes in his neighbourhood. He was carrying a plastic bottle and white flag when he stepped outside his house in search of water, and was shot through the heart by an Israeli sniper positioned in a building across the street. His two older brothers came under fire and were critically injured when they tried to drag him back into the house. Dalal al-Sabagh, 23, shot through the neck by a bullet fired from an overlooking IDF sniper position, as she hung out laundry on the roof of her home in Jenin, 9 March 2004. The IDF declared that it was unable to determine whether she had been killed by the IDF. (Photo: Assafir, 11 Mar 04). 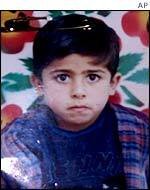 Akram Naim Astal, aged 6, blown up by an Israeli booby trap bomb buried in a footpath leading to Abdullah Siyam Primary School in Khan Younis, Gaza Strip, on 22 November 2001. Akram's brother Muhammad (13), and cousins Omar (12), Anis (10) and Muhammad (12), were killed by the same bomb as they walked to school. The IDF denied any responsibility for the deaths, alleging that the children had played with an unexploded Israeli tank shell. After questioning in the Knesset by Meretz leader Yossi Sarid, the army subsequently acknowledged that the bomb that killed the five children had been planted by an undercover unit and that it "might have been activated" by an officer. Dina Rami Matar, aged 2 months, one of nine children under the age of eleven who were killed when an Israeli F-16 dropped an American one-ton precision "smart bomb" on an apartment building in the al-Daraj neighbourhood of Gaza City on 23 July, 2002. Her mother, two siblings, aunt and cousin were killed in the same attack. Asked later by a Ha'aretz interviewer whether he had any remorse about the incident, Air Force Maj. Gen. Dan Halutz (who had ordered the operation) said: "If you insist on wanting to know what I feel when I release a bomb, I will tell you. "I feel a slight bump to the plane as a result of bomb's release. A second later it passes, and that's all. That is what I feel." (Source). Halutz has since been promoted to Israeli Chief Of Staff. Alaa Muhammad Matar, aged 10, aunt of Dina Rami Matar, one of nine children under the age of eleven who were killed when an Israeli F-16 dropped an American one-ton precision "smart bomb" on an apartment building in the al-Daraj neighbourhood of Gaza City on 23 July, 2002. 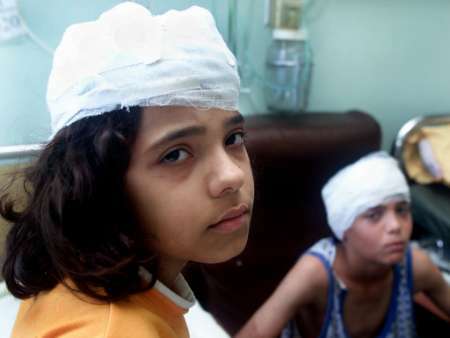 Iman al-Hwiti (10) and her brother Tareq (13), two of about 150 civilians who were wounded when an Israeli F-16 dropped an American one-ton precision "smart bomb" on an apartment building in the al-Daraj neighbourhood of Gaza City on 23 July, 2002. 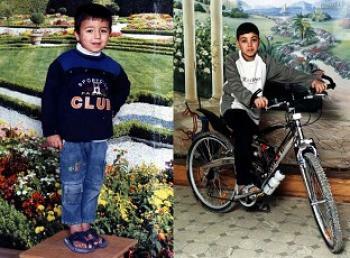 Their mother, Mona, and younger brothers Muhammad and Subhi were killed in the same attack. 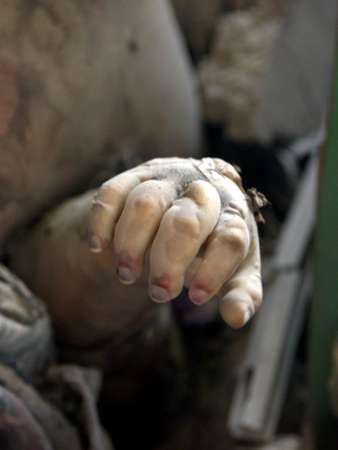 Unidentified dead woman, one of fifteen civilians who were killed when an Israeli F-16 dropped an American one-ton precision "smart bomb" on an apartment building in the al-Daraj neighbourhood of Gaza City on 23 July, 2002. 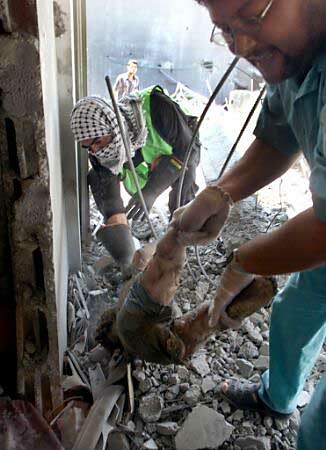 Unidentified dead child, one of nine children under the age of eleven who were killed when an Israeli F-16 dropped an American one-ton precision "smart bomb" on an apartment building in the al-Daraj neighbourhood of Gaza City on 23 July, 2002. 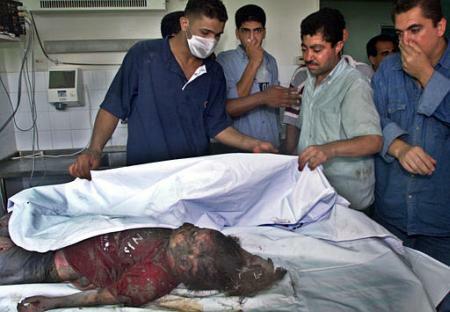 Unidentified dead girl, one of nine children under the age of eleven who were killed when an Israeli F-16 dropped an American one-ton precision "smart bomb" on an apartment building in the al-Daraj neighbourhood of Gaza City on 23 July, 2002. 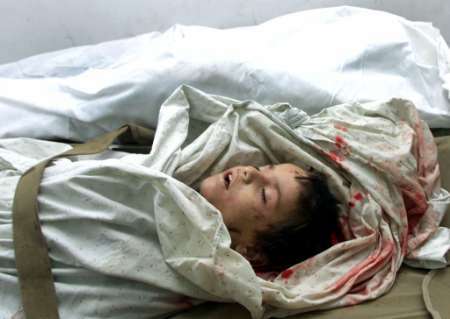 Unidentified dead boy, one of nine children under the age of eleven who were killed when an Israeli F-16 dropped an American one-ton precision "smart bomb" on an apartment building in the al-Daraj neighbourhood of Gaza City on 23 July, 2002. Unidentified dead toddler, trapped under rubble. One of nine children under the age of eleven who were killed when an Israeli F-16 dropped an American one-ton precision "smart bomb" on an apartment building in the al-Daraj neighbourhood of Gaza City on 23 July, 2002. "Give us your F-16 fighters, Apache helicopters, Hellfire & Flechette missiles, Tank shells, Flechette shells, Snipers, Special Forces and "Smart Bombs", and you can have our bomb belts."